TIG welding requires a high level of dexterity to come up with finished products which are structurally sound and effortlessly clean. The minimal smoke generated by TIG welds has made it a hot favorite among automotive, experimental aircraft and sculpture designing industry. Considered unanimously as one of the toughest welding types, TIG welds usually have to abide by strict standard requirements. However, since you are browsing through our blog, chances are high that you are planning on bringing home one for yourself. Opting for one having unnecessary functions will simply hike up the final cost. Thus, if you are not planning on welding magnesium or aluminium, you will not feel the need of a welder having AC capabilities. It is imperative gauge your power requirements to suffice you present and future needs. Splurging on the same immediately is much better than investing in a bigger machine down the road. Work capability and flexibility is bound to get bottlenecked while starting out with a low to average performance welder making it difficult to accomplish tasks demanding higher accuracy level. Rather than purchasing multiple ones having limited usage and applications, it is always advisable to proceed with a versatile model. Bulkier welders require separate cooling units for unleashing its full power potential which in turn can increase the overall cost significantly. Thus, it is necessary to know in advance whether the unit picked by you requires a cooling unit for maximizing its output and duty cycle. It is essential to comprehend the power capabilities since certain welders’ function both in 110v and 220v. However, the power output at 110v will be drastically less than 220v. You should make it a point to examine the unit’s input voltage to ensure that it matches with what is available while using the unit. To avoid this mistake, it is advised to select a welder based on the specific voltage supply of the particular location where the machine is intended on being used. 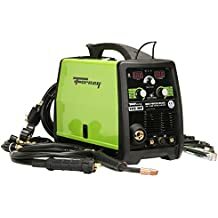 Today we have reviewed the five best TIG welders below the 1500-dollar price category available in the marketplace which according to our understanding shall serve you best. This entry level TIG welder from the house of Hobart blends in both AC& DC functionality while operating at 230V. With easy to use controls in the form of a single switch for DC & AC operation and one dial for adjusting amperage between 10 and 165 amps the EZ TIG 165i has been designed keeping in mind the amateurs. Its foot pedal ensures easy control during operation and helps users in attaining a non-contact arc start courtesy the high frequency initiation. The device also packs in some other features which assist in enhancing its longevity such as auto high temperature shutdown and on-demand fan which brings down the quantum of potential debris which otherwise gets pulled inside the unit during the cooling process. With easy toggle option between 110V and 220V, the Hobart offering can weld both aluminium and steel. The built-in unique knob control of the EZ-TIG 165i makes it extremely easy to be set up and used. The HF start helps in starting the non-contract arc and eliminating material contamination and tungsten on the way. Endless amperage control provides with broader operating range. On demand fan reducing the intake of debris and dust. Higher arc consistency through the inverter based power. Bulky design weighing 50 pounds hindering portability. The latest offering from the house of Everlast featuring analogue inverter mechanism expands the versatility of PowerTIG 200DX model by adding a digitally controlled and dual voltage IGBT inverter. The portable unit can be easily used in sync with all generators having a sustained 3500 watts ranking and carrying the ‘clean power’ certification. The welding unit comes well stocked with an array of features which can guarantee a smooth welding experience while handling all forms of welding jobs in a single pass. Users don’t need to worry about the voltage type while using the Everlast PowerTIG 200DV given its AC and DC capability. The welding unit also tags along a completely adjustable AC frequency and an AC balance control. Its adjustable pulse mode can be of great help in welding heat sensitive metals and is functional in both DC and AC voltage settings. The digital readout feature aids in reading the amperage settings while using the welding unit in torch switch mode. The colour coded controls have been incorporated to ease out the selection process and make it easily understandable. Ergonomically styled accessories and torch. Dual voltage options of 20V and 240V. Arc force control to improve arc performance and reduce splatter. The unit does not come with any shielding gas or filler rod. 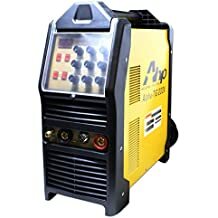 This high-powerful 200 amps AC/DC TIG welder paired with stick function can cater to the requirements of both professionals and hobby welders beautifully. 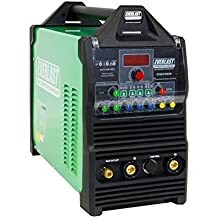 Without having to break a bank, this top quality yet affordably priced welder ranks high on performance in both 110v (150-amp output) as well as 220v category. The large array of cleaning controls for AC and pulse features make this welding device boasting of IGBT technology and Power width modulation enthral users with its long lasting and reliable power source. The versatile welder packs in a separate TIG control switch meant especially for those who wish to add the trigger switch along with the torch and standard TIG torch consumables. The foot pedal control manufactured using high quality metal enhances user comfort while the easy to dial knob comes as a breather over digital menus which can get perplexing at times. Perfect for welding stainless steel, 1/4th inches of aluminium, 3/8th inches of mild steel and thinner gauge materials, the AlphaTIG comes with a 3 years’ warranty to ease out every possible cause of concern within the mentioned time frame. Pulse works exactly as expected. Greater controls for user adjustment. Inaccurate gauge and moderate flow meter. Design of the foot pedal is not ergonomic. If you are on the lookout for a welding device which shall guarantee you optimum flexibility, then the Forney 324 is sure to get your requirements sorted. With a maximum output of 190amps, this versatile multiprocessing welder is capable of Stick, MIG and DC TIG welding. Thus, by shelling out just the price of one you can benefit from the features of three different machines which gets accentuated with good amperage and incredible arc control. Perfect for general fabrication and maintenance and repair of light industrial appliances, boats and automotive this MIG ready machine comes braced with a gas hose and a regulator for easy switching between welding processes. Offering quality features such as standard MIG and synergic MIG modes,quick “euro” style disconnect torch,stick electrode holder,HD cast aluminium feed/drive system with drive tools and geared idler, longer gun/torch with common consumables, extra-long power cord and spool gun capability, this state-of-art welder is bound to impress you with its functional prowess. Although the foot pedal and TIG torch does not come with the machine, the same can be purchased separately for hassle-free usage. Digital display of actual arc voltage and output current to aid in precise management of functions and data. Euro-Connect MIG gun to lighten torch issues and quickly switch between long and short modes. Longevity of wires get accentuated by the cast aluminium drive system. Minimizes spatter to produce high quality welds by optimizing the arc. No meant for heavy duty welding. Duty cycle of 20% at 190 amps makes it tailor-made only for lighter and smaller jobs. This dual voltage welder can suffice your steel as well as aluminium welding requirements with its intuitive and clear controls. The plethora of features offered by this machine makes it tailor made for the experienced lot although it can also cater to the beginners once they pick up its basic functions. 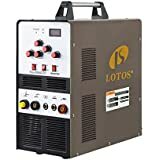 Weighing at 58.7 pounds, the LOTOS welder is robust enough for taking on your work requirements in a seamless fashion. Although several lighter contemporaries are available in the market, you won’t face any problem courtesy its integrated handle which aids in moving around the device in a hassle-free manner. All the switches are neatly stacked in the control panel so that you don’t have to move around haphazardly searching for the same. One of the most striking attributes of this versatile welder is its foot pedal which can serve you well in the long run once you get a grip on the same. It can thus free up your hands so that you can concentrate more on the job for exercising greater precision. The automated process of this model makes it easy to toggle between 220 and 110v. The voltage requirement gets automatically detected by the machine for making according adjustments. With a duty cycle of 60% you can make use of this machine to weld metals having thickness ranging from quarter of an inch to 6mm. 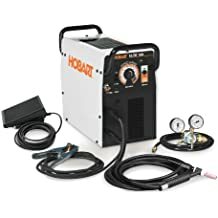 Budget price point makes it ideal for amateur welders who wish to bring home a good machine without spending a fortune. Square wave inverter assists in accurate welding of fine quality aluminium. The kit comes with everything which is necessary to start with welding such as ground clamp, stick electrode holder, argon hoses, etc. It might take a long time to get accustomed to the foot pedal. The popular TIG welding process forms an arc by utilising a metal workpiece and tungsten electrode. It also shrouds and cools the arc area by using an inert gas such as argon as well as shields the electrode and weld pool. The manual TIG welding process involving both the hands is recognised as one of the most versatile methods when it comes to dealing with various metals. Well-defined and cleaner joints are produced through TIG welding which requires less finishing effort. Although used frequently in aluminium welding, it works well at ease with other metals such as copper, titanium, nickel, magnesium and their alloys. TIG welding machines come with various price tags depending upon their specifications and features. It is of primary importance to scan through significant factors contributing to the machine’s versatility, ease of use and performance attributes before taking the final purchase call.